" This product is excellent! No need to tighten down to hold chin in place. Very comfortable. I would recommend this to all who needed one. " 11% of Chinstrap product buyers choose this product. 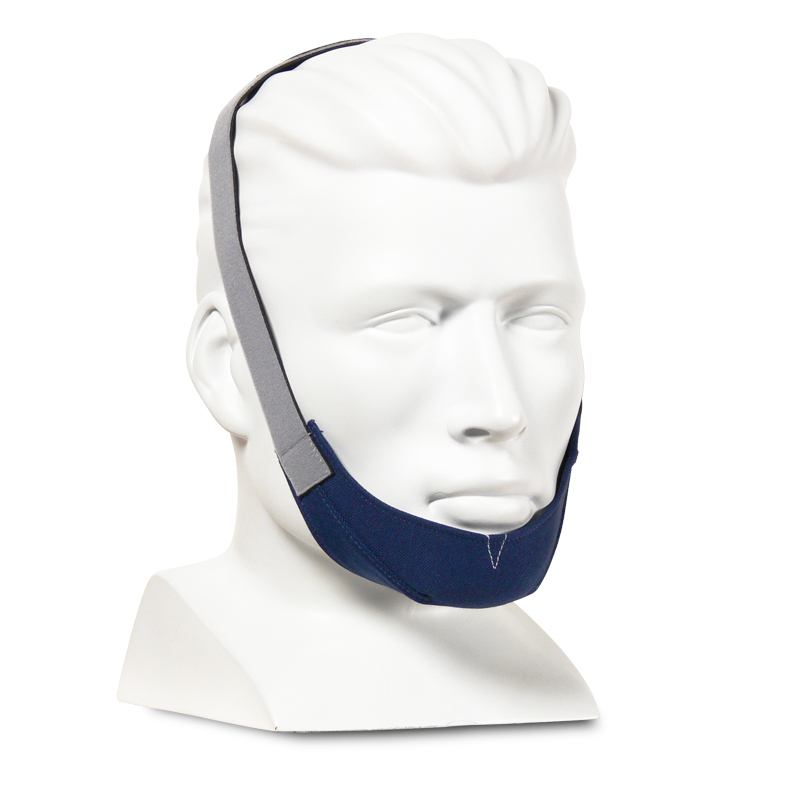 This comfort friendly chinstrap fastens itself at the top of the head. It has a chin cup made of soft cloth and installs easily. The straps of the Sullivan Chinstrap are made of neoprene & Breathoprene, the material used in the majority of mask headgear. 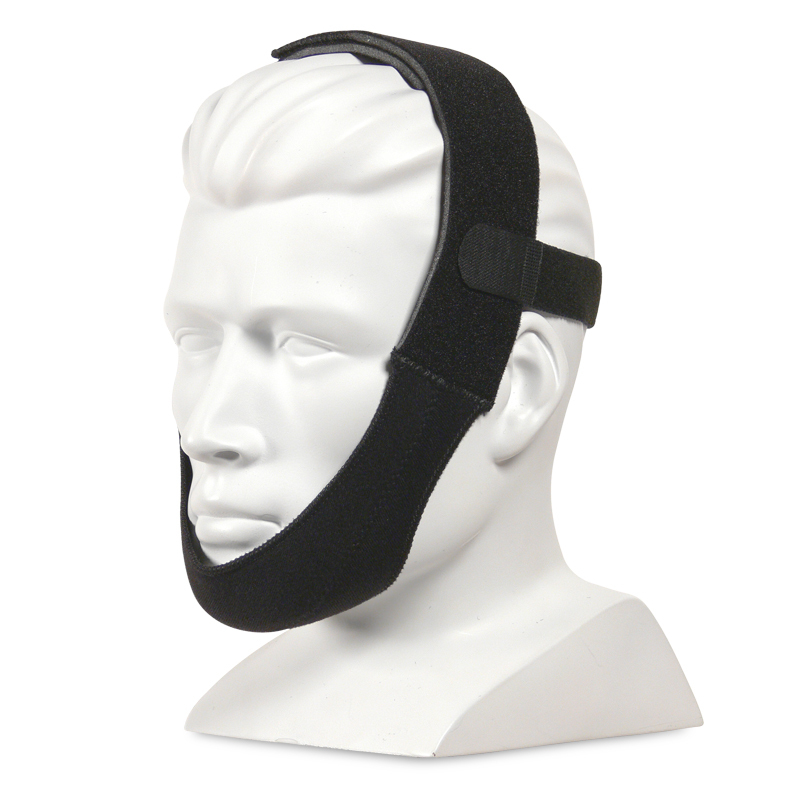 The chin cup of the Sullivan Chinstrap is made of a non-elasticized textile made up of a brushed nylon and cotton knit blend. Length: The overall length measured without stretching is 27 inches. Please see our other chinstraps for longer lengths and designs. The chinstrap should be worn with the stitched 'V' mark closest to the bottom lip. Bring the straps up and around your cheeks; fastening the Velcro on top of the head. 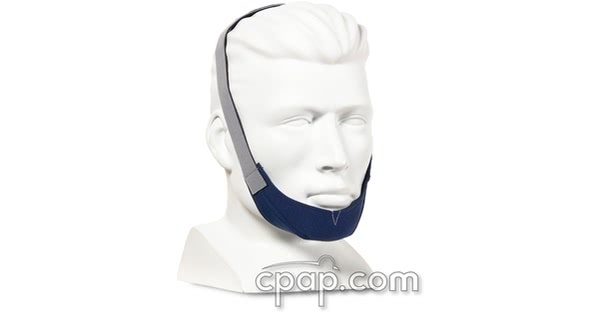 The strap can be worn either over or underneath your CPAP Mask headgear. This product does not contain elastic. It does contain neoprene, nylon and cotton. I breathe through my mouth, what are my options? People who have a deviated septum, small nostrils, or who suffer from seasonal allergies or chronic sinus issues, may breathe through the mouth rather than the nose. If you are a person who breathes through your mouth you may be able to wear most masks with a few adaptations. 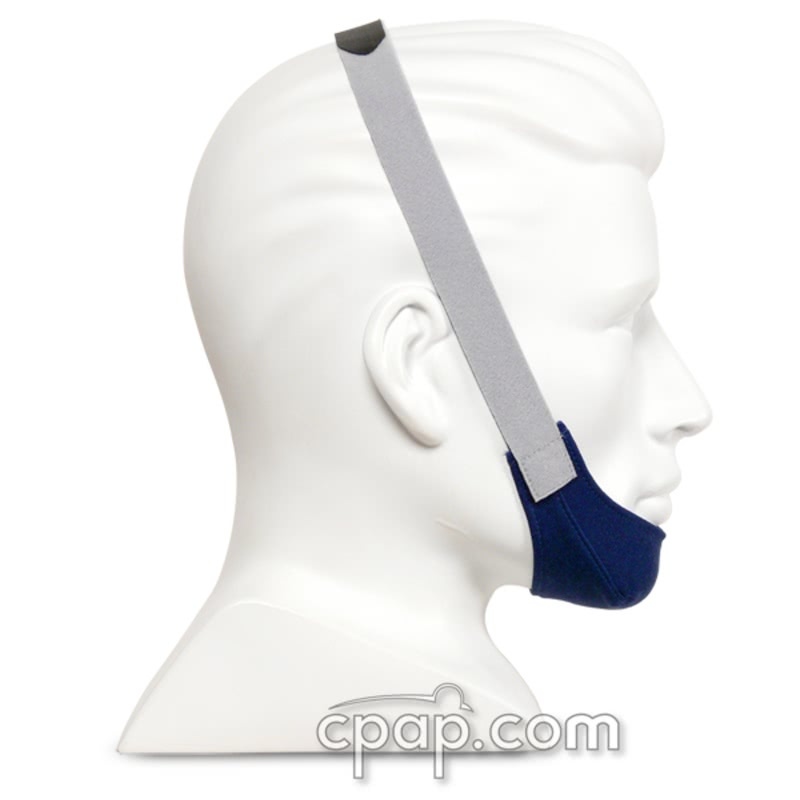 Add a Chinstrap if using nasal pillows, nasal prongs or a nasal mask. A full face mask or hybrid mask can be used without a chinstrap because the seal covers both the nose and mouth. A full face mask will allow you to breathe through your mouth or through your nose. If you suffer from chronic sinus issues, a full face mask or an oral face mask are good options. Oral masks work best for mouth breathers with blocked nasal passages. You must use a heated humidifier with the oral mask. CPAP.com sells the Oracle HC452 Oral CPAP mask. If you are a mouth breather who cannot or who does not want to wear a chinstrap, please see our recommended masks for Mouth Breathers. What is the purpose of a chinstrap? Nasal delivery devices are the preferred mode of delivering CPAP air. They are smaller, lighter and usually more comfortable, with many styles and sizes to choose from. When using a nasal device with a CPAP, it is imperative that the mouth remain closed for the pressure to be maintained and the therapy to be effective. Most people will automatically keep their mouth closed while on CPAP, but some are unable to do so, at least in the beginning of the therapy. Use of a Chinstrap is the first response to opening the mouth during sleep. 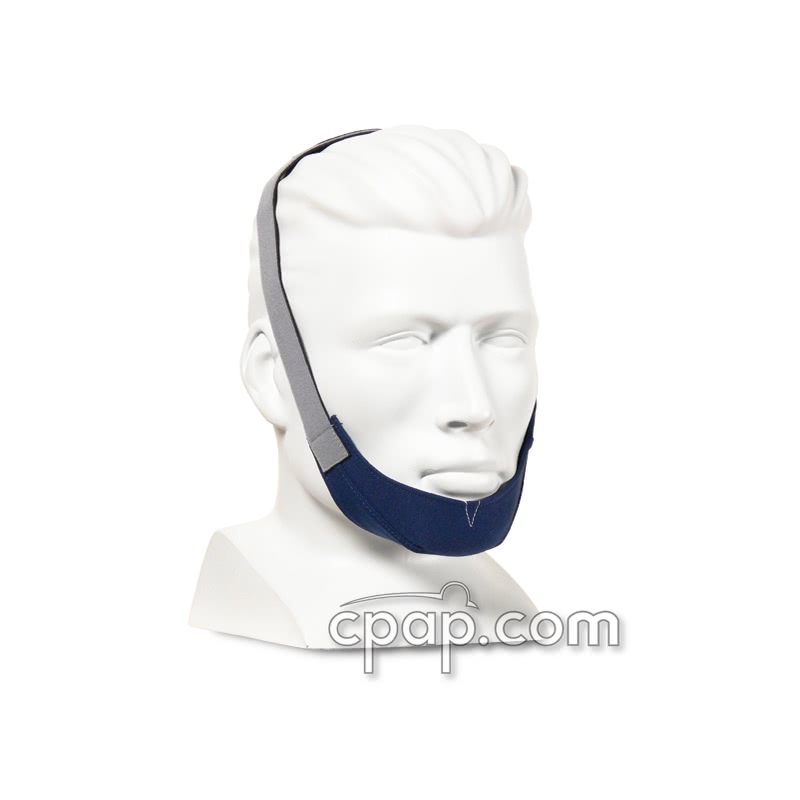 It is worn in addition to the CPAP mask to hold the jaw up and help keep the mouth closed. Even with the use of a chinstrap, some people are still able to breathe through their teeth and lips. If so, a Full Face Mask is an option worth considering. What styles of chinstraps are there? A basic chinstrap cups the chin and has narrow straps that connect at the top of the head, usually with Velcro. It works best for those who sleep on their side and who do not open their mouth very much. The straps may fall forward or backward on the head if not held in place by the mask headgear. An example of this type of chinstrap is the Sullivan Chinstrap. For greater strength, a wider chinstrap is available. The width of the strap is sufficient to cup the chin, and narrow straps are available to attach across the forehead to keep the chinstrap from falling back, as well as across the back of the head to keep it from falling forward. This style of chinstrap is more stable, but it may cover the ears. An example of this type of chinstrap is the Premium Chinstrap. Another style of chinstrap is a series of straps that cup the chin at a lower angle for greater support, and include the stabilizing straps in the design. An example of this type of chinstrap is the CPAP.com Deluxe Chinstrap. The answer to this cycle is humidification. If the mouth continues to open during sleep, a chinstrap may be needed to hold the jaw up so that the mouth can close. If mouth breathing continues, a full face mask that covers the nose and mouth is indicated. Dry mouth is a sign that you are opening your mouth while you sleep. If you use nasal mask, breathing through your mouth bypasses any humidification you may be using so increasing the heat will not be effective. Breathing through your mouth while using a nasal mask reduces the benefit of the CPAP therapy. If your mask is new and NOT leaking, try a chinstrap to keep your jaw up and mouth closed. If a chinstrap doesn't solve the problem, try a full face mask that covers your nose and mouth.